Sweep or wet-vac them away. With AdvanTech, puddles are not a problem. AdvanTech flooring is a water resistant, dimensionally stable engineered strand product that was designed to withstand exposure to moisture during normal construction delays. In some areas, frequent and lengthy rain storms result in standing water on the floor systems of buildings under construction. 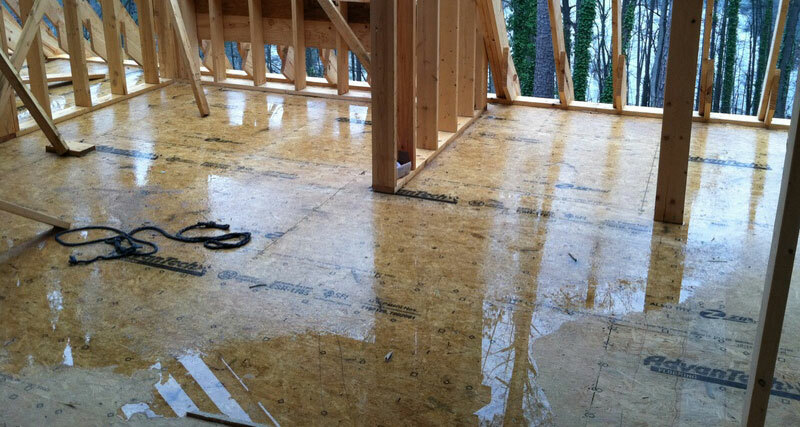 Although AdvanTech flooring will remain dimensionally stable in these conditions, it is best to remove standing water from the floor deck to expedite the drying process. The floor deck should be dry prior to installation of finish floor coverings. Sweeping and wet vacuuming are the preferred options for removing standing water on floor decks. Sweeping may be difficult if wall framing has been installed. Drilling well spaced weep holes no greater than ½” is a common approach but is the least effective method for removing standing water. If the floor deck is relatively flat, the weep hole will only drain water in the immediate vicinity of the hole. Plastic tarps spread on the floor deck prior to rainfall are the best prevention against accumulation of standing water. However, this option is only feasible if wall framing has not been erected. Additionally, care must be taken to prevent water from collecting under the tarp. Water trapped between the tarp and the decking may contribute to development of mold and mildew. It is therefore best to remove tarps as soon as rainfall has stopped. Water repellent coatings are not recommended with AdvanTech flooring since they may interfere with the performance of finish floor coverings and may void the limited lifetime warranty. —This tech tip is provided by AdvanTech® flooring, one of ProTradeCraft’s advertisers. AdvanTech flooring is a name builders trust for unique combination of strength and moisture resistance for subfloor that installs fast and stays flat. Find an AdvanTech flooring dealer near you.